Michael Brady stands in front of one of his ship illustrations. 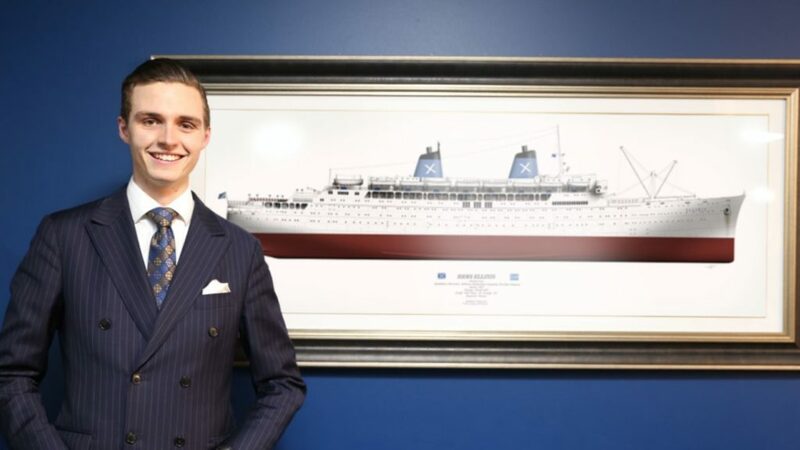 Ever since he was young, 24-year-old, Michael Brady, has been fascinated by ships, and not just the beautiful old luxury liners like Queen Mary and Titanic, but also the historic ships that carried people to Australia from all parts of the world, in particular, the Greek migrants who left their homes seeking a better future down under. “My father migrated from England on SS Strathnaver, a P&O ship, in 1959 and has been obsessed with ‘his’ ship ever since, so I think I got my initial fascination from him, and it only grew from there,” says Michael who slowly started researching and developing a real interest for the passenger ships that Greeks boarded to travel to Australia. The young industrial engineer admits that his love for Greeks was also influenced by his father’s stories that he heard over the years. “My father met a lot of Greeks on the ship during his journey to Australia and always said that the one thing he remembered vividly from his interaction with them, was that they were the most hard working and determined people he had ever met,” says Michael who after graduating from Design School at Monash University in Melbourne, decided to launch his own industrial design business specialising in maritime illustrations. Interestingly, the concept of Liner Designs was born last year on the young engineer’s father’s 70th birthday. After seeing his father’s overwhelming reaction, Michael decided to set up his own business and create illustrations of Greek migrant ships. He was especially drawn to the Greek community because of the pride the Greeks took in their ships. “I feel like there has been a special attachment between the Greek migrants and their ships which I was keen to explore further and the more I speak to them and their children, the more I get the feeling that for a lot of these people, their migration story literally started on those ships. “Think about it for a moment. 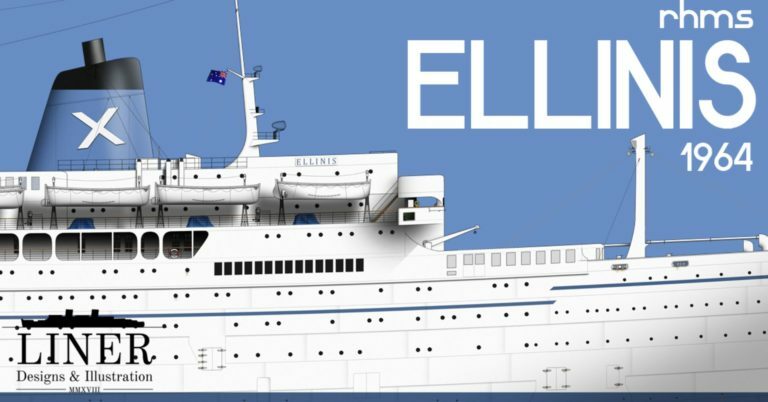 Even just the names they used to baptise their ships can generate a reaction; Australis, Ellinis, Patris. They are such powerful and patriotic names, let alone the fact that for most of those families heading to Australia, those ships WERE their ‘Greece’ for the duration of their voyage. Many have fond memories of the trip and I have heard lots of funny, moving, tragic and touching stories from passengers and crew,” says the 24-year-old maritime illustrator who explains that his reason for starting his company, was to provide the opportunity for people to bring back a part of their family history. Although for Michael the work involves very technical drawings, the result tends to be quite emotional for his clients and the feedback he has received from the Greek community to-date has been overwhelmingly positive. Michael’s drawings are sold in different sizes as framed prints or as posters and each person can even have their family name or initials put on the ship’s rigging as signal flags. The young designer has already finished a large part of the Chandris Line ships which came to Australia and is now in the process of designing and adding the very famous ‘Patris’ to the fleet. “All of these ships are now long-gone to the scrap heap and just about forgotten. By drawing them on my computer, I am trying to bring a part of them back to life. “Greeks and their legendary ships have rightly earned a place in Australia’s migration history and I am grateful I have found a way to tell their stories through my designs,” concludes Michael.